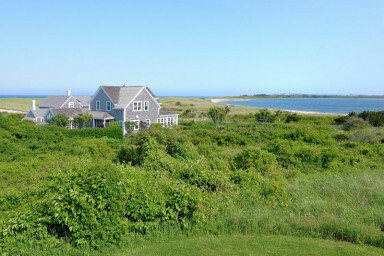 Quintessential adults only Nantucket cottage overlooking Sesachacha Pond. Directly in front of Sesachacha Pond, sits a quintessential Nantucket cottage. This charming adults only home, built in 2011 has beautiful rose and hydrangea filled gardens and welcomes you with warm fireplaces, soft down beds with wonderful linens, a beautiful country kitchen, a collection of antiques and luxurious bathrooms. A perfect romantic getaway! As you stand on the threshold of The Cottage, your first sensation is relaxation washing over you like a warm shower. Is it the panoramic view of Sesachacha Pond or the rhythmic beat of the waves meeting the ocean shore just over the dunes? You are greeted by the most beautiful sea garden filling your senses with beauty reflected in the lightest pink roses and multi-colored hydrangeas. The home welcomes you with warm fireplaces, soft down beds with wonderful linens, a beautiful country kitchen, a collection of antiques and luxurious bathrooms. The outdoor patio with Adirondack furniture and cozy and romantic dining pavilion fill your mind with visions of candlelit dinners and wonderful warm afternoons watching the clouds go by. Due to the antique furnishings, this accommodation is not suitable for children. Adults only.